Following yet another spectacular win at UFC 228, Zabit Magomedsharipov is now looking forward to making another huge statement for himself by eyeing a potential clash against top UFC veterans Jose Aldo or Chad Mendes. 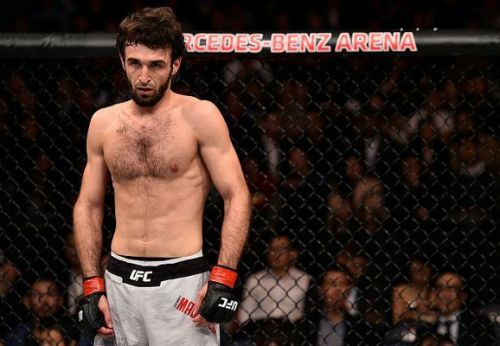 Russian fighter Zabit Magomedsharipov signed with the UFC in May of 2017 and was immediately expected to make his debut against Nick Hein, however, that fight eventually got scrapped due to the latter pulling out on the 21st of August. Zabit, however, made his debut against Mike Santiago and subsequently won his first UFC fight via submission Rare-Naked Choke in the second round. At the recently concluded UFC 228 pay-per-view on Sunday, Zabit once again successfully impressed everyone by picking up another amazing submission win against Brandon Davis in the second round. Shortly after his successful win over Brandon Davis at UFC 228, Magomedsharipov did not waste time in declaring who he wants to face next in the Octagon. In a backstage interview with Megan Olivi, the upstart Featherweight fighter noted that he would like to share the Octagon with Chad Mendes or former 145-pound champion Jose Aldo. Magomedsharipov's next fight in the UFC has not been decided just yet and the 27-year-old definitely seems to be hungry for more. Only time will tell what the future holds for such a promising talent.